All standard and advanced features are covered by our standard set-up fee (unless otherwise noted). Your set-up can be adjusted to reflect the design of your website by adjusting the banner and colour scheme. With the reporting module you will be able to create custom reports and statistics interactively for your events. 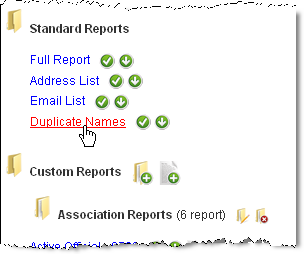 The custom reports can be saved for re-use and a number of standard reports are available (e.g. Full Report, New or Changed Registrations, Address List and Email list). Was a waiver or parent's consent form received? If paid by cheque or cash: was the payment received? If yes, when? These fields are fully integrated in reporting so that you can easily generate list of registrations with outstanding waivers or payments. A rich-text editor is available for formatting your emails and you can include graphics and links. The number of mailed-in/off-line registrations can be entered in order to adjust the available spots for online registrations. Custom add-ons require separate set-up fees and/or custom programming charges. Please contact us for a quote. A promo-code report is available that shows which codes have been used already for what registrations and which codes are still available. For associations and clubs, we also offer a Membership Administration add-on to the online registration service. The web-based member administration service offered by Karelo.com will allow your organization to perform member-related administrative tasks over the Internet. In conjunction with the Member Admin add-on, event registrations can be configured to check the membership status of the registrants. This is useful for member-only events or if a reduced registration fee for members is offered. Based on data entered by the registrant for an event or a membership renewal, documents can be generated which are pre-populated with the registrant's personal information. These documents can be generated as a Word or pdf-file for downloading and printing. Custom checks and data entry validation are possible to ensure that the registrant's selections do not violate logical dependencies between fields. Other options are custom calculations, e.g. group discounts, discounts depending on the registrant's selections etc.